Taking care of your family, job, home, and school on your own is the glamorous life of a single mom. It can be quite a challenge, especially when funds are tight. 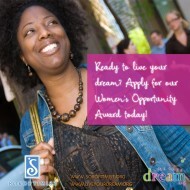 The Soroptimist Women’s Opportunity Awards invests in women like you with a chance to ease the financial burden of higher education and family expenses. This program awards more than $1.5 million in educational grants to over 1,000 women around the world. The awards range from $3,000 to $10,000. It aids in paying expenses related to achieving a higher education, like tuition, childcare, transportation, or books. The primary financial support for your family? Able to provide proof of your financial need? Currently enrolled, or are accepted to, an undergraduate degree program or vocational/skill training program? Driven to achieve educational and career goals? A resident of the United States, Argentina, Bolivia, Brazil, Canada, Chile, Colombia, Ecuador, Guam, Japan, Korea, Mexico, Panama, Paraguay, Peru, Philippines, Puerto Rico, Taiwan, or Venezuela? Not a previous Women’s Opportunity Award winner; a Soroptimist member, employee of the organization, or an immediate family member of either? If you said YES to all of these questions, then you should apply here. Applications open July 2016 and are due by November 2016. To inspire and show you that you CAN do this, take a look at the courageous and real stories of last year’s finalists. For more information about this award, please see the Applications Instruction page here.